My name is Laura Hempel and I am a PhD student at Oregon State University. This website is about me and my research. I study how the flow regime controls stream channel organization in gravel-bed rivers, or put more simply, how differences in the amount and timing of river flow lead to differences in the shape and structure of river channels. 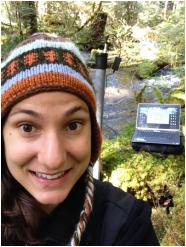 For the past 4 years, I've been working in the central Cascades to characterize and compare two end-member hydrologic systems: highly stable spring-fed systems and flashier snowmelt systems. In the fall of 2015, I extended this research to physical modeling. I ran a series of flume experiments to investigate the effect of different hydrographs on channel development at the University of British Colombia. Ultimately, my research will allow scientists and managers to predict how channels will respond to changes in the hydrologic regime caused by climate change, land use practices, or dams.